You are important to us, and we’d like to show you our gratitude! By signing up for an account at madelineislandcandles.com, you are automatically entered into our new Appreciation Program. 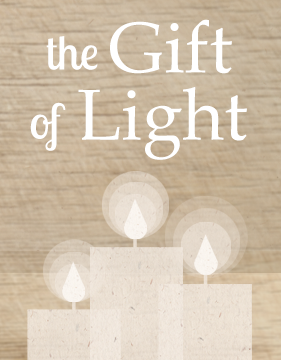 Earn the Gift of Light with each online purchase, to use for yourself or to share with others. By purchasing our all natural candle products, you earn more Gifts of Light, seen in the cart as Appreciation Points. Save them up to use on your next purchase, or gift them to a friend! Do I have Appreciation Points? Simply create an Account at madelineislandcandles.com to start earning Appreciation Points. Returning customers: make a purchase before the end of August and receive credit for your previous purchases! Just be sure to log in to your Account to receive your points. * Purchase: Earn 1 point for every $1 you spend on madelineislandcandles.com. * Register: Earn 10 Points when you create an account at madelineislandcandles.com. * Join Our Newsletter: Earn 10 Points when you sign up for our Newsletter. * Review a Product: Earn 2 points per Product Review, with a maximum of 40 points/day. Please note that Reviews must be approved, so these points will be added to your account upon approval. * Refer a Friend: Earn 10 Points for inviting a friend to join our program, with a daily limit of 50 points. Points will be added after the friend has opened an account with us. Additionally, earn Points on 5% of the referred friend's purchases! * Receive a $1 credit for every 20 Appreciation Points. Or, share the Gift of Light with a friend, by purchasing an e-Gift Card for them with your points. Copyright © 2015 Madeline Island Candles, All rights reserved.